Toyota's 8-Series Stand-Up Rider was built with the ultimate performance and comfort in mind, delivering improved ergonomics, reliability and durability while reducing service intervals. Spacious operator compartment with 8" low step height eases frequent entry and exit during the work shift for reduced body fatigue. Backrest, armrest and floor mat offer cushioned lean points to reduce the effects of vibration and standing stresses. Integrated clipboard, amenity tray and cup holder provide a convenient, easy-to-reach, mobile workstation. Universal low-effort brake pedal allows for flexible positions to increase operator productivity while maneuvering in either direction. Shock dampened isolated operator floor with 7/8" thick, cushioned operator floor mat offers shock tempering that reduces operator fatigue. Single-axis multifunction control handle allows control of travel, lift/lower, tilt and two optional auxiliary functions. Extended operator backrest option offers additional 10" of comfort for tall operators. 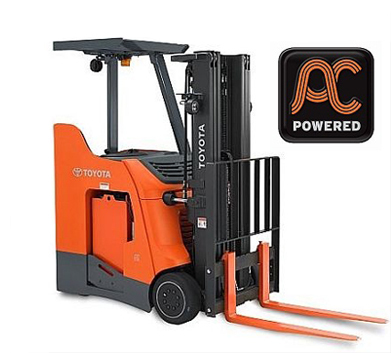 AC powered system offers fast response to operating commands, precise power control, compact components and higher levels of productivity throughout the entire work shift. AC drive motor offers quicker acceleration, higher top speeds and smoother direction changes to help operators move more pallets per hour. AC lift motor features fully variable lift/lower control for fast, precise pallet retrieval or positioning. Auto-position hold maintains the forklift's position on an inclined surface for maximum control. Optional integral sideshifter minimizes truck movements for storing and retrieving loads to increase overall operator efficiency. Anti-stall protection cuts off power to the forklift to prevent the motor from overheating. Cornering speed control option automatically slows the forklift's travel speed while turning to help prevent damage to loads and tipovers. Mast tilt centering conveniently levels the forks parallel to the ground from both the back tilt and front tilt positions, improving operator efficiency and productivity. Moisture-resistant electrical connections are less susceptible to water intrusion and corrosion. Large diameter drive tires enable the truck to withstand continuous impact between dock plates and trailers. Powder-coat paint finish provides added durability against paint flaking or chipping on impact. LED lights option offer less maintenance and longer life. Dual steer tires reduce loading by 30% for extended tire life. Rugged chassis and mast designed to exceed the demands of your toughest workplace. AC Motors have no brushes, springs, commutator or wearable parts to service and replace, resulting in fewer, quicker and less expensive maintenance needs. Planned maintenance service intervals of 500 hours doubles the time between service visits. Self-diagnostics help maximize uptime by checking critical functions at start up. Built-in analyzer simplifies troubleshooting and eliminates the need for an external hand-held analyzer. No directional contactors reduce periodic maintenance and inspection time. Self-adjusting electric disc brake reduces costly downtime by eliminating routine maintenance. Battery connection location offers the operator easier access to the connector and keeps the battery cables confined to the compartment. Periodic maintenance notifies operators of the need for routine maintenance and service via the digital display monitor. The service intervals are programmable.